ONCE IN PRAGUE, HOW DO I GET TO FORUM KARLÍN? The nearest stop is called Křižíkova. You can find in on the yellow metro line. To get to the venue take a quick 4-minute walk. If you take trams number. 1, 3, 8, 24, 25 or 92 you have a chance to get off on Křižíkova stop. Buses with numbers: 135, 136, 175, 194, 207 and H1 should get you pretty close to the main venue (Forum Karlin) then you can reach this destination by foot from a specific bus stop. This walk might take you approximately 15 minutes. Driving a car in Prague’s city center might be a bit challenging. We highly recommend you to choose one of the public transport options for reaching the address of the main Venue and leave the car in the hotel or home. Moreover, there is no reserved parking lot for ReactiveConf attendees. Official tourist information center of the City of Prague, so-called Visitor Centre, run by Prague City Tourism. The latest tourist center is located in the very center of the city, at the crossroads of Na Můstku and Rytířská streets. It also includes an exchange office with clear exchange rates and fees, a small rest area for visitors and free Wi-Fi access. Prague Castle has been an important symbol of the Czech state for more than a thousand years. It was founded in the 9th century and became the seat of Czech rulers and later presidents. Prague’s oldest bridge was begun in 1357 by Charles IV and was completed in 1402. From 1683 to 1928, 30 statues of saints were carved to decorate the bridge, the most famous of which is the statue of St John of Nepomuk. This outdoor cultural center and bar are located in Letná Park. It offers an opportunity to use the space formerly taken up by the Stalin memorial as a pleasant place for meeting friends and relax while enjoying the unique view. At the same time, it functions as a platform for entertainment or the introduction of modern art. The commercial and administrative center of the city and the site of important social and historical events. It was created by Charles IV in 1348. The square is dominated by the National Museum (1885–1891) and the statue of St. Wenceslas from 1912. The Town Hall was established in 1338 as the seat of the Old Town administration. Every hour between 9:00 and 23:00, twelve apostles appear on the famous 15th century Astronomical Clock known as Orloj. Petrin Tower was built as part of the Jubilee Exhibition in 1891 as a free copy of the Eiffel Tower (at a ratio of 1:5). It is 63.5 metres high and 299 steps lead to its top, which is at the same altitude as the real Eif- fel Tower. Bus lines from across Europe operate through Prague with many services terminating at the central bus station at Florenc. One of the leading domestic and international transporter is Regio.jet. Here you can find the right line for you. Use your GPS navigation and set the destination: “Prague,” your hotel address or “Forum Karlín, Pernerova 51,186 00 Prague 8-Karlín, Czech Republic” and we are sure you will get to the right place. Prague Airport is located approximately 17 kilometers from the city center (Wenceslas Square). There are several ways how to get to the city center: Private Pickup, Uber, Public transport or Shuttle bus. Metro is the easiest, fastest and the best way of transportation in Prague. You can get to any part of Prague within a few minutes. 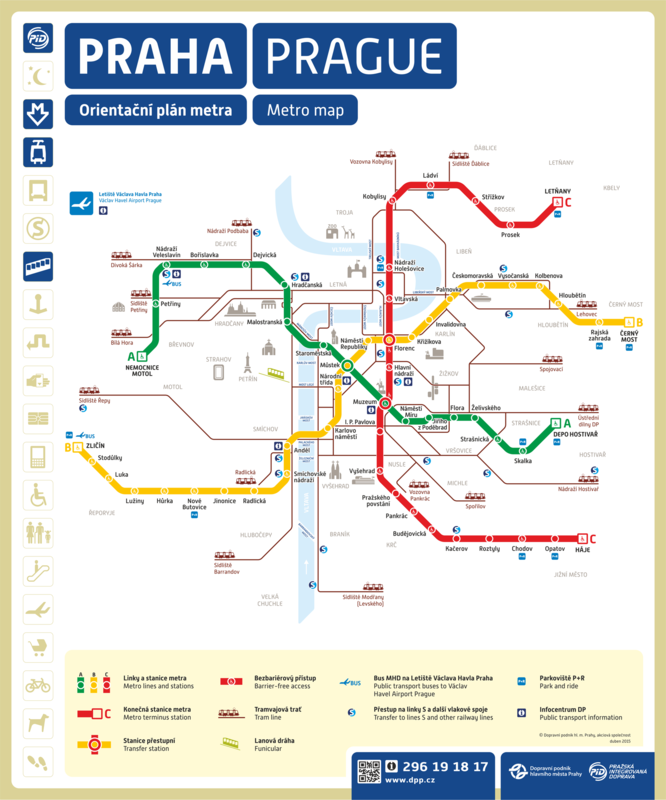 Here you can find the online Prague’s Metro Map or download it from official Prague’s Public Transport webpage. Trams run across Prague on 21 daytime and 9-night lines. Tramway is an excellent choice for those who want to see more of the city on their way to the Conference Venue. Here you can download an official tram schematics PDF. Buses on 118day and 15night lines serve mainly areas without rail traffic, the outskirts of the capital city, or create a quick connection around the city without the need of getting into the center. The suburban PID lines also connect Prague with its surroundings. Here you can download an official bus schematics PDF. Many of the city’s main attractions are in and around the Old Town area and are reachable by foot. However, you will need to use public transport at some stage during your stay. Here you can download an official public transport schematics PDF.